The figure shows the vertical structure of phytoplankton blooms (in units of chlorophyll mg/m3) in the South Atlantic from an ocean physical-biogeochemical model. In order to predict changing climate patterns in the coming years and decades, scientists need to understand the various interactions that take place within what is referred to as the earth system. This means understanding and predicting the interactions between atmosphere, land surface, ocean and sea ice, - known as the physical system - as well as the biogeochemical processes, such as the carbon cycle, which interact with this physical system. Today scientists can sucessfully model this system, but it entails an immense level of computing power. 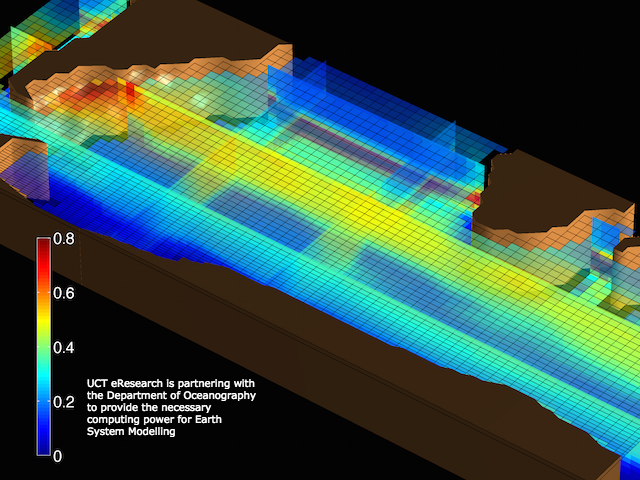 This is why the Department of Oceanography is partnering with UCT eResearch to use high performance computing (HPC) facilities for ocean and climate modelling. Associate Professor Marcello Vichi and scientists at Department of Oceanography will, through their NRF grants, contribute up to R400 000 a year to computational development of the central HPC facilities within eResearch. Earth system modelling is, because of the sheer scale of the endeavour, an interdisciplinary enterprise involving atmospheric scientists, oceanographers, ocean chemists and biologists. The oceans play a crucial role in these models, explains Vichi, not only because of its role in heat storage and transport, but also because of its immense carbon storage capacity. "To date, the oceans have been offering a very effective carbon storage service, with steadier rates than terrestrial vegetation and soil, but we are unclear on how long the oceans can keep storing carbon like this and at what level,” says Vichi. In order to properly understand the carbon cycle within the earth system, oceanographers need to be able to simulate the ocean system. In order to simulate these ocean processes, a number of factors — such as salinity, temperature and currents — need to be added in to the calculation. But of course, the seas and oceans of the world are not uniform. So, says Vichi, oceanographers run regional simulations in which they section off portions of the ocean and then break that area up into smaller sections. The size of these sections depends on the resolution of the model, he explains: usually, global ocean models have a resolution of about 25 km. “This means many points within the region and at every point data needs to be gathered and calculated,” he says. It can get even smaller: if researchers are interested in reproducing the features of a particular region like the South African coast, the model can drop down to between 2 and 4 kilometres, and to capture coastal processes and interaction with coastal configurations, researchers will need a resolution of around a single kilometre. This is the where HPC, also referred to as parallel computing, plays such an important role, as it allows the researchers to run these computations concurrently. “We need multiple core infrastructure capable of solving the same thing at the same time in a different location,” he says. But the computational resources for this kind of modelling is mind boggling. To remedy this, Vichi is making sure his postgraduate students are provided with the tools available, in a manageable way, so they can begin working on modelling solutions. This access for postgraduate students also adds considerably to the need for computing power. He says the value of a shared system outweighs the cost, which is why he is happy to contribute a portion of research funding to building and maintaining the system, as well as the training for the system.